PANGKALAN BUN, Indonesia—It was rainy that Sunday morning. The sky was thick with cloud cover and visibility was quite low. Rahmat (his only name), a 44-year-old fisherman from the village of Kampung Kubu in Central Kalimantan, Indonesia went out to sea as usual. He never thought that what he would see at that day would end up being one of the key pieces of information that eventually lead to the discovery of AirAsia’s missing Flight 8501. Based on his hint, the rescue teams focused the search on the area where the flight was ultimately found, on the third day of searching. The Airbus A320-200 disappeared from radar screens roughly 40 minutes into a routine flight from Surabaya, Indonesia to Singapore on December 28. It took two days of intensive search efforts from sea and sky to finally locate the wreckage and begin the work of unraveling why the plane went down killing all 162 on board. “I heard a big boom followed by some kind of white cloud. I didn’t think it was a cloud we normally see during the rainy season,” Rahmat told Epoch Times. Rahmat didn’t know what he saw. After the incident, he was forced to come in from the sea early because of rain and high tide. In Karimata Strait, where the debris was found, waves can surge to up to 10 feet (3 meters) during the rainy season. “It was not until the next day [Monday], that I realized what I saw might be the missing flight. I saw it on TV news,” the Kampung Kubu villager said. Kampung Kubu is a village located at Kumai, Pangkalan Bun, in Central Kalimantan. It is a small village where communication and transportation are not as advanced as other areas in Indonesia. Most of the villagers there make a living from fishing. 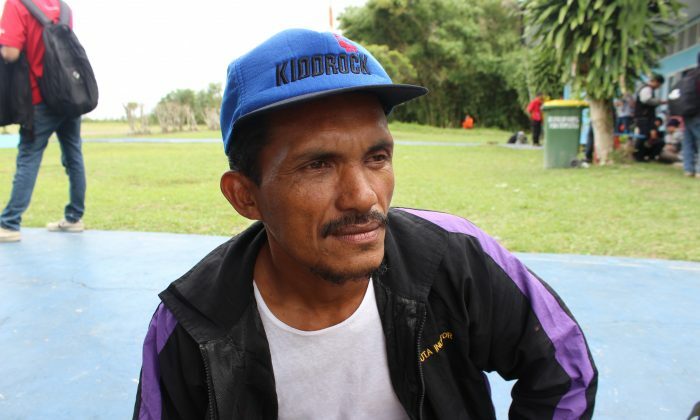 “After I heard the news, I reported it immediately to the local chief,” said Rahmat. Many officials from search and rescue units came to question him. On the third day of the missing flight, the debris and victims’ bodies were found. The remote location and stormy weather played a significant role on the slow progress of finding Flight 8501. Indonesian officials said Saturday that they were confident wreckage of AirAsia Flight 8501 had been located after sonar equipment detected four massive objects on the ocean floor. Victims of AirAsia Flight 8501 appeared to be holding hands in the water, according to reports from Indonesian search and rescue teams.